Gray Vireo /Hawks Aloft Inc. The Gray Vireo is a small migrant songbird breeding in pinyon-juniper woodland of the southwestern United States. 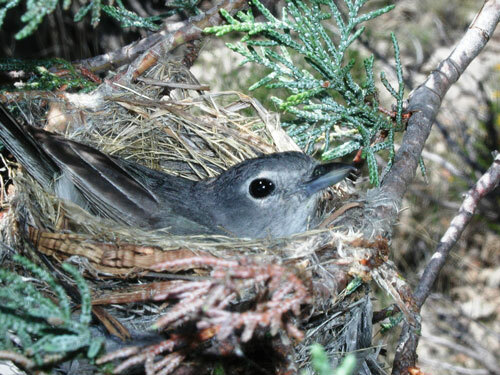 Gray Vireo was listed as threatened in the state of New Mexico by the New Mexico Department of Game and Fish, but relatively little is known about populations in our state. In 2005, Hawks Aloft began annual monitoring of a Gray Vireo (Vireo vicinior) population in southeast New Mexico. We found high rates of Brown-headed Cowbird (Molothrus ater) nest parasitism and low vireo productivity at that site. We added a second site in northwest New Mexico in 2007. Today, we conduct species specific surveys for Gray Vireo at a variety of locations throughout New Mexico. Habitat selection, nest success, and trend comparisons between these populations offered insight into the current status and threats for this species.